(Last Updated : 07.01.19). HTET TGT Answer Key 2019 : 06 January Level-2 Solved Question with Answer (General Studies - Reasoning, Aptitude & GK) - Here is Part-III Answer Key of HTET TGT Exam January 2019 held on 06.01.2019 in morning session. Official answer key of TGT Level-1 exam 2018-19 has been released by HBSE on 07.01.2019 (as per the schedule). 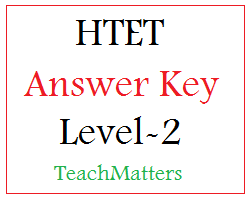 So, here is official answer key of Level-2 HTET Exam 06 January 2019 with solved questions. Note : The answer keys uploaded here are unofficial and will be updated* at regular intervals. Final answer key of TGT Exam 06.01.2019 can be checked here as and when the HBSE Answer Keys are available on the official website.